I started the day with an odd request from Cox Automotive president Sandy Schwartz. He wanted to meet first thing at the vAuto booth at 8:30 a.m., just as the exhibit hall opened. Turns out, Sandy was playing coy, along with a few other members of the vAuto team. 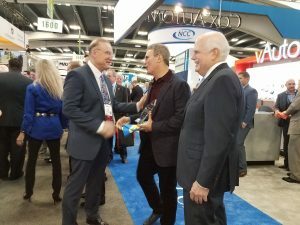 Their secret: They’d arranged for a special stop-by from NADA president Peter Welch, incoming NADA dealer chairman Charlie Gilchrist and outgoing chairman Wes Lutz to present an award to commemorate my attendance at 50 consecutive NADA conventions. I was flattered and truly surprised when a big group of people gathered around me to present the award. The moment made me reflect on how fortunate, grateful and proud I am to be a supporter of NADA, its mission, and the dealers they represent. I attended my first NADA convention in 1969 in Houston. It was a big moment for me. It meant that I would be at the convention with my Dad and brothers, rather than on the receiving end of payphone calls when my brothers would tease me about all the swag and trinkets they’d collected at vendor exhibits. In 1969, dealers were worried about the strength of their franchise agreements, as factories were changing warranty reimbursement rates, and dissident groups affecting local businesses. While I was only 10, I knew that Vietnam war and other protests were in the news all the time, and had a lot of people worried. This year’s NADA convention theme, Focus on Innovation, is fitting for the current time. 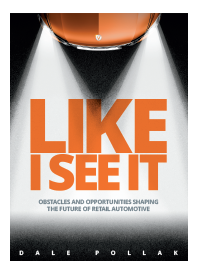 Dealers are entering an era of automotive retail where it will be more difficult to become and remain successful. To succeed, dealers will need NADA. They will also need to innovate—a topic I’ll be addressing in upcoming dispatches from San Francisco. Congratulations, Dale! I have been honored to hear you speak and meet you in person twice, at our store and my NADA Academy class. You are a wealth of knowledge and a truly wonderful goodwill ambassador for our business. I appreciate you very much, Sir! Thank you so much for your kind thoughts and words. Please feel free to call me if I can ever be of personal assistance.